Conservation of Keys - The Chip's Challenge Wiki - The Chip's Challenge Database that anyone can edit! 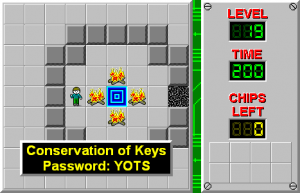 Conservation of Keys is the 19th level of Chip's Challenge Level Pack 4. It was created by Josh Lee. To complete the level, the goal is to make it through the maze of keys and collect the fire boots. After collecting the boots, you have to get rid of all keys in your inventory allowing you to pass the force floor section and exit. It is worth noting that you cannot collect a single green key, as there is no way to get rid of it once it is collected. Off of the force floor section play 2R 2U 2R 2D 2R, collecting 3 blue keys, 2 red keys, and 4 yellow keys. To get rid of the keys, go back through the path you cleared to the first red lock, picking up the blue key in front of it. 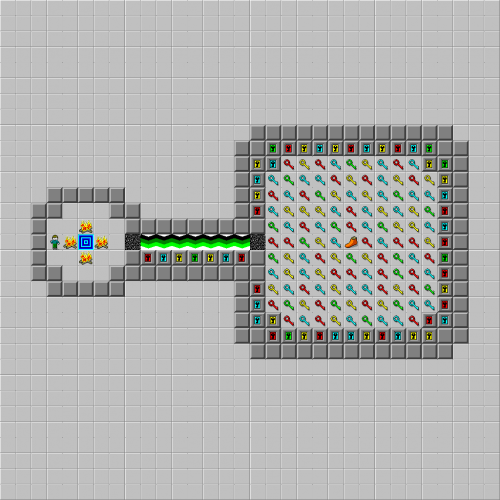 From there, open all the locks around the edge (taking an extra key when you path around the green lock) until your inventory is empty, which should occur after opening your fourth blue lock. To finish the level, go back through the empty path behind you and go straight for the exit. This level was ported to Chuck's Challenge, but was named Conversation of Keys by mistake. This page was last edited on 29 March 2019, at 09:24.